Caribbean sailing vacations for individuals, couples, families and friends that are fun filled and stress free. "Thank you Capt Doug for the most incredible week we could have imagined. The float plan was perfect, instruction while sailing superb, encouragement, laughter, food, knowing all the right spots to hit and when. We can't say enough, thank you. We loved every minute." 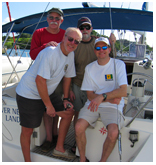 "Captain Doug took our family on the most fabulous trip through the BVIs in June. Great snorkeling, great food, incredibly beautiful - and all unplugged and on island time! Can't wait to do it again." "BEST VACATION EVER!! Thank you so much for everything Captain Doug." "I'd take this over a cruise anytime! Sailing with Captain Doug was the best vacation we ever had and we've been to some pretty cool places." Are you seeking the Caribbean less traveled? Love to sail? Book your sailing vacation today with a skipper who knows the islands and the waters surrounding them. Join Captain Doug and sail to unspoiled islands off the beaten path. These vacations are for sailors who want to see the Caribbean close-up. Sail to where there are quiet coves, gorgeous anchorages, stunning sunsets, deserted beaches, Caribbean ambience and perhaps a sandy beach bar where you'll meet interesting people from around the world. Leave the cold weather behind and go to where your footprints will be the first to mark the sand.